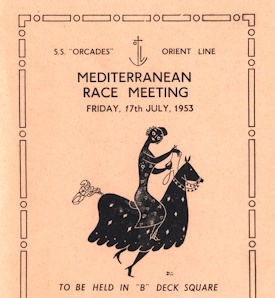 After a sumptious dinner on Friday 17 July 1953 on board S.S. "Orcades" there was a Mediterranean Race meeting to be held in "B" Deck Square at 9.15pm. Considered to be one of the highlights of the voyage the horses have been bought in advance and the owner usually appoints his wife as jockey. To heighten the sense of drama and occasion one beat of a gong is sounded four minutes before the start of each race, and two beats two minutes before the start, when the Tote will close. 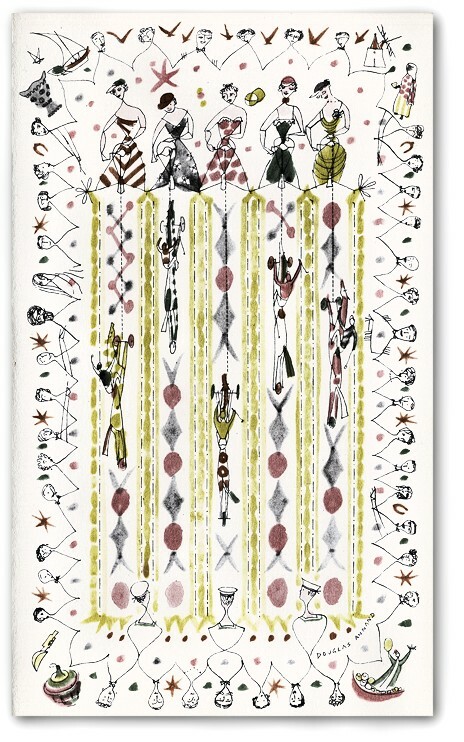 The horses have been placed on the starting line; the function of the jockey is to wind in the horse as speedily as possible to the finishing line, however, the jockey must ensure she does not remove her hands from the winding handle. The jockeys, in particular, the suppleness of whose wrists is of much importance are the object of the most intense interest. The winning horse in each race will run in the final. Although this important function did not figure in the Racing Calendar, for many passengers, it would have been the most exciting meeting of a lifetime. The artist's impression, on the front cover of the dinner menu, has delightfully captured the excitement of this evening meeting on board the cruise ship - one of the joys of travelling by sea.